A new Marvel series, EXILES, features X-Men from alternate dimensions. One Exile is John "Thunderbird" Proudstar, the Apache military veteran who became Marvel's first Indian superhero. Rather than dying early, as the original Thunderbird did, this version was mutated into a monster. In EXILES #5-6, the team journeys to an alternate world with a third Thunderbird. This John Proudstar has inherited the mantle of Shaman, the mystical Sarcee medicine man and superhero from Canada's Alpha Flight. The two Proudstars talk, revealing things about the original Thunderbird—and about the state of Indians in comics. Eliminating stereotypical physical details such as John Proudstar's headband (while he's a civilian) and pinkish skin. Improving the speech and behavior pattern of both versions of Proudstar to "normal." Although that's inconsistent with the character's first appearance, it's also less stereotypical. The idea that the Apache Proudstar would abandon his belief system to study Shaman's "mysticism." In theory, a Native person's religious, spiritual, and philosophical beliefs are bound into an indivisible whole. Native people would say you have to be a part of a culture, immersed in it, to understand its religious worldview. That someone from a tribe a few thousand miles distant, with no knowledge whatsoever of Sarcee beliefs, could study long enough and become proficient enough to be deemed a "shaman" is patently unlikely. It's about as unlikely as T-Bird's joining the Catholic priesthood and eventually becoming Pope. Theoretically possible, yes; realistically plausible, no. This conceit perpetuates the idea that Native religion and spirituality aren't much more than a grab-bag of magic tricks. That all Natives have simple beliefs similar to each other's. That Natives can easily abandon one set of beliefs and adopt another. It's as if becoming a medicine man is no more difficult than becoming a doctor. In fact, the origin of the original Shaman, Michael Twoyoungmen, drew parallels between being a doctor and a medicine man, but they aren't the same thing. A medicine man is as much a priest as a doctor. He attains the position by having dreams and visions that reveal the otherworldly to him, not by hitting the books hard. A better comparison would be a doctor who goes to school for years vs. a priest who not attends a seminary for years, but is filled with God's spirit, born again into a different way of seeing and thinking. In other words, the move would require a radical mental realignment. It's not simply a career choice any Indian could make. Moreover, the transformation is more or less involuntary. Medicine men don't choose to see spirits; the spirits choose them. That the Sarcee spirits would select an Apache to represent and interpret them defies the imagination. 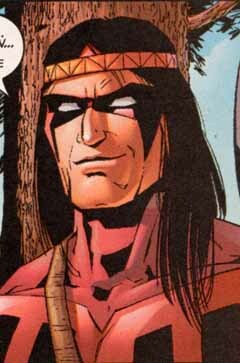 A rough-and-tumble ex-soldier Apache like John Proudstar probably has no more feeling for Sarcee beliefs than Cyclops or Storm does. He's about as likely to become that tribe's spiritual leader as I am to become the Dalai Lama. That's a serious flaw in the "T-Bird becomes Shaman" scenario. It's an interesting notion, but it's subtly stereotypical. Shamans, medicine men, or priests?